Min vän och fd kollega Samuel Skwarski (@samuelskwarski på Instagram) är en kaffe-connoisseur av rang. När han frågade om han fick gästblogga lite om sina bästa kaffebarer i Stockholm så fick han självklart fria händer. Det blev ett fint engelsk ångande inlägg så våra internationella vänner också kan dra nytta av den. Jag bidrar endast med en bild från min favoritbar Sempre. Håll till godo! I have always loved coffee and it’s probably the one thing I can’t be without. And I’m not alone. Sweden continously rank among the top coffee loving countries in the world. Just behind Netherlands and Finland in a cup-per-capita-ranking done by Euromonitor, Swedes rank third with 1,37 cups of coffee per capita per day. That’s about 7,000 cups a year for each and every coffee-drinking-Swede out there. This means there’s no lack of places to get a brewed cup of coffee in Stockholm. 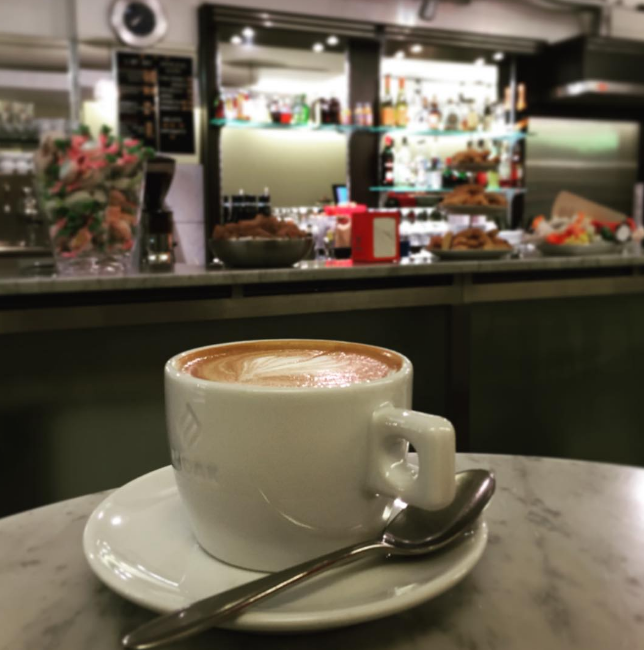 Nonetheless this guide is about italian cafés in Stockholm, and especially the one’s where Baristas speak fluent italian and know when and how to drink Cappucino, Macchiato or Espresso. Now that is something harder to find. Prego! Sempre, Jakobsbergsgatan 7, subway station: Östermalmstorg. Open 7.30 AM to 6 PM Monday through Saturday, closed on Sundays. Sempre is an italian gem hidden in plain sight in the middle of Stockholm. Located at Jakobsbergsgatan it’s often overlooked when tourists rush by on their way to Biblioteksgatan (home to Stockholms high-end stores). ”The only thing in here that isn’t Italian is me and the Yoghurt” says Per Friedrich who runs Sempre with a steady hand on the polished Espresso machine. Nonetheless, Sempre is super-Italian and serves the best coffee in town paired with great paninis and italian pastry, from early morning and into the evening. Apart from Mr. Friedrich the staff is all Italian. Visit during lunch for any coffee you like (all are perfect!) and a grilled panini sandwich enjoyed to the tunes of italian disco classics and the sound of bankers chatting away in the line for their lunchtime caffeine fix. On some Thursdays and Fridays Sempre hold the doors open a little longer to host an italian After Work with anti-pasti + drinks for under 200 SEK, accompanied by the tunes of local DJs like Nadja Chatti (resident at nightclub Trädgården). Poli Caffé, Sankt Göransgatan 70, subway station: Fridhemsplan. Open 7 AM to 5 PM during Monday through Friday, and 9 AM to 4 PM on the weekend. Placed next to a Lidl Supermarket in busy Fridhemsplan this Espresso bar can feel a little out of place. But fear not, inside a warm greeting and a strong Espresso awaits. The coffee at Poli Caffé is served in a quick manner by two elderly italian men while they chat away with their regulars. Order a double espresso. Drink it by the marble counter and be on your way. Ciao! Café Dello Sport, Pålsundsgatan 8, subway station: Hornstull. Open 9 AM to 5 PM. Café Dello Sport opened 1996 and claims to be ”Sweden’s First Italian Café”, but it’s actually much more to it than that. In the morning you’ll get fresh bread from the bakery for half the price of any other café in Stockholm, and in the afternoon Café Dello Sport serves Pizzas and Paninis to local customers and visiting guests. It’s not a fancy place but rather a second home to all Italy loving neighboors. At Café Dello Sport the TV always shows either Italian Formel 1 or Seria A games. Perfect for wandering minds. Visit early morning or just before a Serie A game starts in the afternoon.